As people age, their risk of cancer increases significantly as a result of various factors, including weight and BMI. 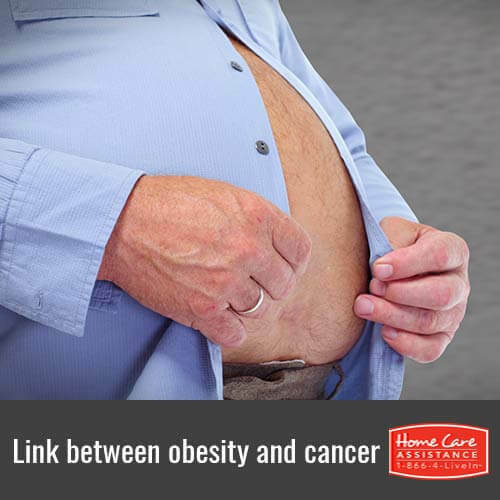 According to the National Cancer Institute, about 34,000 cases of cancer each year are attributed to obesity. Home care providers in Rhode Island want families to understand the relationship between obesity and cancer to help seniors improve life quality and longevity. How Does Obesity Increase the Risk of Cancer? Stored fat cells produce excess levels of estrogen hormones, which are linked to many types of cancer. These fat cells also produce leptin, a hormone that stimulates the cell growth associated with various cancers. Another reason obesity raises cancer risks is that severely overweight seniors tend to have higher insulin levels, and insulin can encourage cancerous tumors to grow. Is Obesity-Related Cancer More Common Among Seniors? According to a study conducted by the Fred Hutchinson Cancer Research Center in Seattle, overweight, postmenopausal women are 58 percent more likely to develop breast cancer than any other gender or age group. Researchers note that the shift in hormones during old age can heighten the risk of obesity-related cancer. What Can I Do to Help My Loved One Reduce the Risk of Cancer? Fortunately regular cancer screening can ensure cancer is detected and treated as early as possible, and losing weight is an extremely effective way of lowering the risk of cancer. The Nurses’ Health Study showed that senior women who lose just 20 pounds lower their risk of breast cancer by over 50 percent. Though complications associated with aging might make it tricky to exercise, a diet plan and mild physical activity can encourage weight loss and lower cancer risks. Seniors face many age-related conditions during their golden years, but taking simple precautions like following a healthy diet and engaging in moderate exercise regularly can help your elderly loved one can reduce his or her risk of these illnesses. Make sure your loved one has the support he or she needs by reaching out to Home Care Assistance. Our reliable caregivers can incorporate the Balanced Care Method in any care plan, helping seniors maintain overall mental, emotional, and physical wellbeing through diet, exercise, and purpose. Call us today at 401.284.0979 to schedule your free consultation.